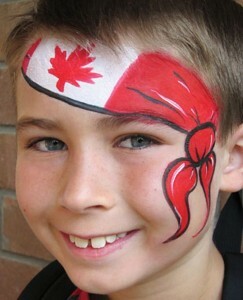 Funtastic Face Painting for all Occasions. Now based in Collingwood, Ontario. Face painting is the perfect entertainment for ages 2 and up – ideal for birthday parties and events. Face painting for cheeks, arms, legs, hands and faces – products are FDA approved and non toxic – only the finest brands in the industry such as Kryolon, Wolfe, TAG, Global, Mehron and Fab products are used. All my glitters are also cosmetic grade and FDA approved. Perfect for Birthdays, Festivals, Fundraising, Private parties, Public events, Grand openings and more! Boys and Girls, Young and Old! Services available to Grey-Simcoe County – Blue Mountains, Collingwood, Thornbury, Creemore, Stayner, Wasaga Beach as well as the GTA. It’s alway’s a thrill to see a child’s eyes light up with delight when they first gaze upon their painted face. No matter what age, the fantasy of becoming something else provides a fun escape into a magical world!